President Donald Trump called out the pundits and the “haters” for their hypocrisy on the North Korea issue on Wednesday. “A year ago the pundits and talking heads, people that couldn’t do the job before, were begging for conciliation and peace,” Trump wrote on Twitter, pointing out many wanted him to meet with Kim Jong-un rather than go to war. “Now that we meet and have a great relationship with Kim Jong Un, the same haters shout out, ‘You shouldn’t meet, do not meet!’” he wrote. Trump shared thoughts on Twitter during his trip back to the United States from Singapore, where he met with Kim in a historic summit. “There is no longer a Nuclear Threat from North Korea,” he wrote. “No longer – sleep well tonight!” he wrote. 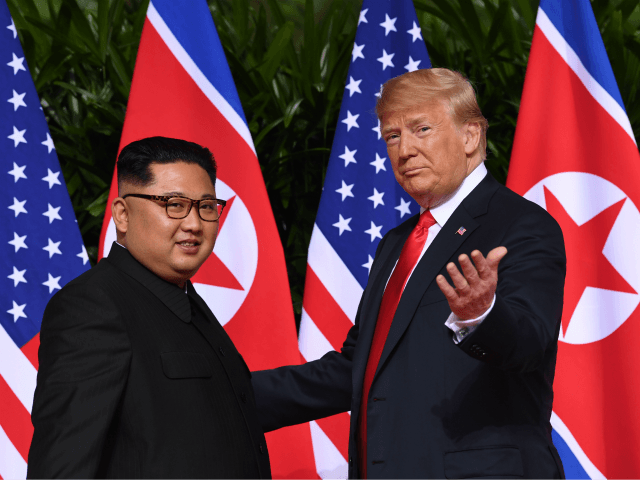 The president said that Kim would stop rocket launches, testing nuclear bombs, and reminded Americans that the hostages held by North Korea were returned to the United States.